Variety of standard and custom sized oval and circle mirrors. 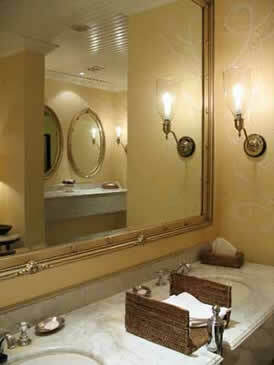 Intimate powder room mirrors perfectly sized and designed for small entry baths. 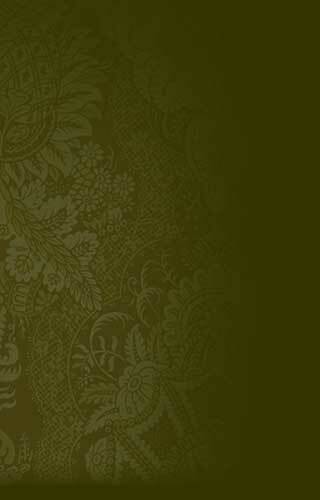 Framed mirrors are all handcrafted and custom built to your exact specifications. Measuring and installation assistance available. New Dimensions can create an exquisite framed custom mirror for the bath, an extension of the room’s original design. From large master bath mirrors with surface mount fixtures to smaller intimate powder room mirrors, we can assist in all aspects of the project. From measurement to design and from manufacturing to installation, we can professionally manage the project from start to finish. 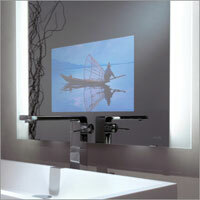 New Dimensions is dedicated to bringing unparalleled elegance to your well-appointed environments. 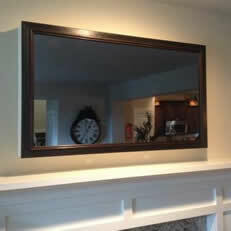 Our hidden television mirrors represent the finest in functionality, style and quality. 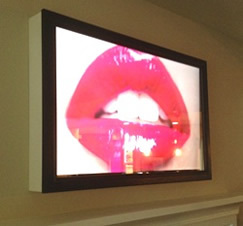 It's a television when you want it, and a mirror when the TV is turned off. We have installed dozens of these mirrors in some of the finest Northwest homes, and we are the experts when it comes to the fabrication and installation of this latest must-have in home decor.